A great activity that shows recycling can be fun and creative! Gather materials needed: Plastic water or soda bottles in different sizes, paper, BioColor® or tempera paint, paint trays and paint brushes. Set out different colors of paint on paint trays or paper plates. Take a plastic bottle and dip the bottom into one of the colors of paint. Now, press the bottom of the bottle onto the paper. Repeat using different colors and/or different sizes of water bottles. Using a paint brush, paint a stem onto each of the flowers. Paint additional details into your painting, such as grass, trees, clouds or more! What other objects can be used in a new way as a method of recycling? Hold a class brainstorming session to help get everyone thinking about ways to reduce trash and save the planet! This entry was posted in 15 Minutes, Age Level, Arts & Crafts, Earth Day, Eco-Friendly, Holidays, Preschool (3-5), Seasons, Spring, Time and tagged art prints, bottle, creativity, earth, earth day, eco-friendly, flowers, kids' activity, kids' craft, recycle, recycled, recycling on April 15, 2013 by dssactivities4kidz. Celebrate nature and decorate your space! Set out the items collected from the nature walk, repositionable clear cover, construction paper, glue and scissors. Gather yarn and a craft stick or wooden rod (optional). Show some examples of the things you’d like the children to look for on their walk: small flowers, leaves, etc. Discourage them from choosing sticks or thick items (pinecones, etc) – explain that flat things will work better for your project. Take your group on a nature walk. Encourage them to gather interesting items, such as single petals, a dropped spray of pine needles, etc. Place in front of each child one sheet of clear, self-adhesive paper, sticky side up. Allow the children to place flowers and other items and arrange them as they’d like. “Sandwich” the cover with another piece, side down. It’s best if an adult does this. Trim any excess if needed. Glue on a piece of construction paper as a backing. Use as a place mat or as a hanging nature window! For a hanging window, use a hole punch to create holes across the top of the construction paper back. Alternate winding a piece of yarn around a craft stick or a wooden rod and threading the yarn through the holes you’ve created in the paper. (Younger ones may need some assistance with this.) Tie the ends together and hang on display. You can use the sandwiching technique with many other items! “Capture” and display pieces of colored paper, glitter, sand, etc. Colorations® Repositionable Crystal Clear Cover – 18″ x 75 ft. This entry was posted in 30 Minutes, Age Level, Arts & Crafts, Curriculum, Earth Day, Environment, Fun With Nature, Holidays, Preschool (3-5), Science, Time and tagged arts & crafts, collage, construction paper, contact paper, creativity, curriculum, earth day, eco-friendly, environment, kids' activity, kids' craft, nature, nature walk, science on May 9, 2011 by dssactivities4kidz. A fun, eco-friendly activity that uses recycled goods from home to create shaker and string instruments that allow for the exploration of rhythm and sound. Have children collect clean plastic food containers (with lids,) tin cans or plastic water bottles, rubber bands, and tissue boxes. You will also need recycled craft paper rolls, paint and decorating items (like glitter, stickers, stamps, etc. ), unsharpened pencils, and uncooked rice and beans to use as the filling for shakers. Make sure all cans and containers are washed and dried thoroughly. Let the children decorate the containers with craft items of choice. It may be easier to wrap some of the containers with paper than to paint on the surface. To make a guitar, have the children wrap rubber bands of varying thickness around the opening of the empty tissue box. “Plucking” the bands will create different kinds of sounds over the opening. To make a cardboard shaker, seal up one end of the craft paper roll with thick paper held in place tightly with a rubber band. Pour in some uncooked rice and/or beans inside and seal the other end of the shaker. To make a plastic shaker, pour the rice/beans into a plastic water bottle and replace the lid. To make a guiro, children can run an unsharpened pencil along the texture of the tin can or plastic water bottle. Tape a craft stick or pencil to one side of the can to act as a handle. Tape open ends of the cans to avoid sharp edges. To make a drum, place the lid on the plastic food container and let the children pat on it with their hands or the eraser end of an unsharpened pencil. Have the children practice “playing their instruments.” Set different rhythms for them to follow by clapping your hands. Let the students have a “solo” or create a symphony by seating students in sections by instrument and when you point to them they play. No instrument will sound exactly the same, and the students will have fun exploring the sounds. Colored Macaroni – 2 lbs. 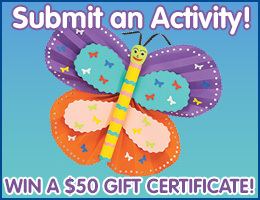 This entry was posted in 15 Minutes, Age Level, Arts & Crafts, Creative Arts, Curriculum, Eco-Friendly, Music, Preschool (3-5), Time and tagged arts & crafts, band, cooperative play, curriculum, eco-friendly, instruments, music, plastic food containers, recycle, recycled, recycled materials, recycling, rhythm and sound, rubber bands, string instruments on January 3, 2011 by dssactivities4kidz. A great winter activity when the weather keeps everyone cooped up inside! Collect clean, white tube socks you are no longer using, materials for stuffing (this can include small beads, batting, crumpled plastic bags, craft sand, dried beans, rice and more), scoops or small cups for measuring, rubber bands, yarn or twist ties. You will also need permanent markers, wiggly eyes and other decorative items, such as pom-poms, buttons, felt and ribbon. Fill a tube sock about 1/3 full with your stuffing materials and secure with a rubber band, small twist tie, yarn, or another tie of your choice. This will be the base of the snowman. If you choose to use lightweight filler, such as batting or small beads, you may want to fill a small plastic baggie with sand (or something else with weight) and place in this base, so the snowman will be better able to stand upright. Repeat Step 1 until the sock has three sections, making each one progressively smaller than the section below it. Fold top of sock down over the last rubber band (or tie) to create a hat for the snowman. Decorate with permanent markers and other craft materials. Display for the holiday season! These little snowmen make great decorations for wintertime and are to fun for children to play with when they are done decorating. Have the children create their own original story about their new snowmen friends. The snowmen can even be used in a tossing game, since the materials you use makes them similar to beanbag toys. Use the counting or measurement of the stuffing materials as a math activity as well. This entry was posted in 30 Minutes, Age Level, Arts & Crafts, Eco-Friendly, Preschool (3-5), Seasons, Time, Winter and tagged arts & crafts, creativity, eco-friendly, kids' activity, kids' craft, recycling, snow, snowman, snowmen, socks, winter on December 27, 2010 by dssactivities4kidz. Have children collect empty, clean cardboard egg cartons (or provide for those who may not have any) and bring from home for this craft. Provide recycled craft rolls, and pre-cut small sections of blue construction paper to cover rolls (this will be the soldiers’ uniforms). Prepare small bowls BioColor® paint for the “hats” you will be making from the individual egg carton sections. Set out paintbrushes, Colorations® markers and crayons, scissors, glue and a variety of buttons to decorate soldiers’ “uniforms.” The teacher may also want to draw circles on the white paper for the faces beforehand to make it easier for the children to cut out. Have them paint the egg carton “hats” and set aside to dry. While the “hats” dry, have children glue the blue construction paper around the cardboard roll for the soldiers’ uniforms. Have the children draw their soldiers’ faces on the white paper (or templates), cut out and glue to roll. Allow children to decorate the bodies of their soldiers any way they like. They can add arms and legs and use the buttons to decorate the fronts of the uniforms if they wish. Encourage the children to experiment when designing the uniforms. Show children how to glue a painted egg carton “hat” on top of their soldiers. Help them do the same as needed. Help the child write his or her name on the backs of the rolls, so they know which one is theirs. Line their original creations up on a counter and display for the holidays in the classroom. This entry was posted in 15 Minutes, Age Level, Arts & Crafts, Christmas, Eco-Friendly, Holidays, School Age (5+), Time and tagged christmas, creativity, eco-friendly, egg carton, holidays, kids' activity, kids' craft, paint, soldiers, toilet paper rolls, toy soldiers on December 13, 2010 by dssactivities4kidz. A fun, eco-friendly activity that uses recycled goods from home to create cute animal pencil cups. To learn about different animals and their different colors, features, etc. Have children collect tin cans from home. Only one end should be cut off. You will also need paint, construction paper, wiggly eyes, feathers, scissors and tape/glue. Make sure all cans are washed and dried thoroughly. Tape any sharp edges. Discuss different kinds of animals. Talk about the colors of the animals’ fur or skin. Have the children point out how a cow and elephant are the same (they both have a tail, four legs, two eyes, etc.) Then, have the children point out the differences. Create a pencil holder in the shape of an animal. Let the children decide which animal they’d like to make. Have the children paint the can in the appropriate colors or patterns. Use construction paper to create the cut-outs for ears, trunks, horns, bills, or snouts of the animals. Use wiggly eyes for the eyes. Have the children tape and/or glue the various features to the can. Rainbow Feathers – 1/2 oz. This entry was posted in 15 Minutes, Age Level, Arts & Crafts, Creative Arts, Curriculum, Eco-Friendly, Preschool (3-5), Time and tagged animals, arts & crafts, biocolor, colorations, construction paper, creativity, curriculum, eco-friendly, kids' craft, nature, pencil cup, pencil holder on June 21, 2010 by dssactivities4kidz. Create a unique, personalized ornament for Mom using recycled materials from home! Have children bring plastic lids saved from clean, empty food containers such as cottage cheese, butter and yogurt (or provide some for those who may not have any). Prepare small bowls with glue and pre-cut circle shapes of Colorations® construction paper to fit the insides of the lids. Pre-cut pieces of ribbon to use for hanging “ornaments.” Set out Colorations® markers and crayons, stickers, buttons, beads, rhinestones, glitter and other appropriate decorative items. The teacher will also need to have scissors available. Talk to the children about Mother’s Day. Ask what kinds of things that they love about their moms or caregivers. Explain that they will be creating their own unique ornaments with a special picture for their moms or someone special in their lives using the lids they brought from home. Provide each child with construction paper circles for their ornaments. Have the children draw a self portrait (or a picture of their special person or mom) on the paper. Glue onto the insides of the lids. Have children spread a small amount of glue with their fingers around the outside rim of the lids. Show them how to wrap ribbon around the lid and press into the glue to secure. Cut off any excess ribbon. Allow the children to decorate the other side of their ornaments with markers, glitter, stickers and other collage items provided. Encourage them to experiment with different textures and colors for this open-ended activity. Help the children cut a small slit near the top of the picture through the plastic lid and weave a piece or ribbon through. Tie the ends together to create a loop for hanging. Now everyone has a unique ornament to give as a gift and display for Mother’s Day. The teacher may also have the children to bring a photo of themselves (or take a photo of each child in the classroom) to use in place of drawing their self portraits. The children could also write (or dictate) a special message, such as “I love my mom” for the inside of the lids. This entry was posted in 30 Minutes, Age Level, Arts & Crafts, Eco-Friendly, Gifts, Holidays, Mother's Day, Preschool (3-5), Time and tagged arts & crafts, creativity, eco-friendly, gifts, kids' activity, kids' craft, mom, mother's day, ornament, ornaments, recycle, recycled, recycling on May 3, 2010 by dssactivities4kidz.